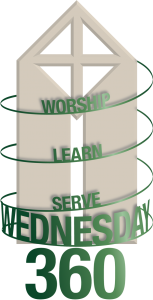 Wednesday 360 is a faith formation ministry for the entire Community. Wednesday 360 meets weekly to build a stronger community through fellowship, music, worship, and faith formation opportunities. It is an evening for all ages! This is a simple catered meal. The cost is $6 / person or$24 / family. This short midweek praise service combines a variety of music and worship styles.